-from "LEWIS WETZEL CAVE," William G. & David P. Fueg, 1975. Reprinted with permission. Lewis Wetzel, born 1763 - died 1808, was a famous local Indian fighter, an accomplished woodsman, and an expert rifle shot. Settlers in the Wheeling area relied on him for years as a trustworthy scout. He was an American frontiersman who became a famous folk hero in his own lifetime. When his father and youngest brother were ambushed and killed by Indians in 1787, Wetzel went on a lifetime crusade against the red man to avenge their deaths. Legend has it that he hunted Indians as if they were wild animals. 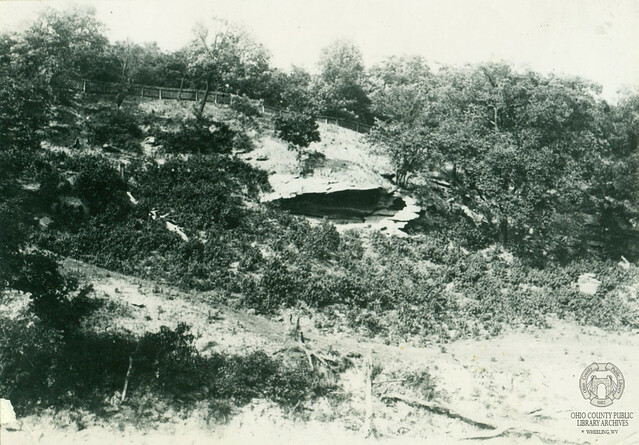 Lewis Wetzel was reported to have used Lewis Wetzel Cave as a hiding place along an Indian trail from which he shot eleven braves. In 1788, Lewis Wetzel made one of his occasional visits to Wheeling where he visited his sisters in Fort Henry. He soon learned of a turkey-call which had been plaguing everyone so much because it had been heard many times and many places, thus giving the call a supernatural quality. Men had tried to find the source of the plaintive sound frequently never returned. After hearing many different stories, Wetzel left the Fort in search of the mysterious bird. Night fell as he searched the hills, so needing a good vantage point, he climbed to the fork of a tree. The mournful cries soon came at intervals and at times seemed to be very close and then far off in the distance. In the light of the moon he saw something pass silently through the brush up toward the top of the hill. He hid in the brush and late in the afternoon a piercing turkey-call broke the silence. "The cries came from the cavern! "(2) Wetzel saw an Indian slowly rise in the mouth of the cave and, "Then, twisting his mouth into a long horn-like shape, the red-skin sent forth the shrill, prolonged, and peculiarly distressing, moaning cry,...(3) Wetzel raised his rifle and aimed carefully at the warrior's head. He pulled the trigger and ended the turkey-cry forever. (1) R. C. V. Meyers, Esq. Life and Adventures of Lewis Wetzel, Philadelphia: Keystone Publishing Company, 1890. pp, 283, 284. Lewis Wetzel cave, located at 40 degrees 04' 22" N. latitude and 80 degrees 42' 37" W. longitude and at an elevation of 704 feet above sea level, has a total surveyed length of 163 feet. The cave is located 124 feet southeast of Tunnel Green of the Baltimore and Ohio Railroad in east Wheeling. The 5 foot wide by 4-foot high entrance is in a sandstone cliff and reduces to a crawlway passage 2 feet wide by 2 feet high. After 20 feet, the entrance passage intersects the main cave perpendicularly, forming a "T"-shaped junction. The passage to the right of the "T" junction extends along a bearing of S 55 degrees E. for 17 feet and is 2 feet wide by 11 feet high. This passage slopes upward to the base of a second entrance which is a pit. This pit tapers to 2 feet by 2 feet at the base. Also, at the base of his pit a low opening connects to a small room which is 10 feet long by 4 feet wide with a ceiling height of 5 feet. Just to the right of the "T" junction is a small room, Indian Attic, which is 10 feet long by 9 feet wide with a ceiling height of 4 feet. At one point it passes over the entrance passage. To the left of the "T" junction lies the main portion of the cave. After 12 feet this passage, which is 4 feet wide and 11 feet high, divides to a small upper-level room and a stoop way which slopes downward to the main room. This upper-level room is 8 feet long by 2 feet wide with a ceiling height of 3 feet. The main room, Flintlock Hall, extends along a bearing of N. 55 degrees W. for 60 feet. The room is 10 feet wide and 11 feet high. The floor slopes upward and the room tapers out in the last 20 feet. At the point where the main room starts to slope upward and upper out is a low opening at floor level which leads to a small room, The Hideout. This room is 15 feet long by 4 feet wide with a ceiling height of 2 feet. The Loft, which lies completely above the main room, is reached by a narrow vertical shaft that is above the junction of the Hideout and the main room; to the south of the shaft, The Loft consists of a small "V"-shaped room 2 feet wide by 2 feet high, with each arm of the "V" about 10 feet long. To the north of the shaft, the Loft consists of an "L"-shaped passage 2 feet wide by 3 feet high; the first segment of the "L" is 8 feet long while the second segment is 15 feet long. Also, a small passage 1 foot wide and 2 feet high leads from the shaft and lies to the southeast of and parallels the first segment of the "L"-shaped passage. A small flowstone formation lies at the "T" junction. The entire cave lies in sandstone of the Conemaugh Series of the Pennsylvanian System. The sandstone is probably Lower Pittsburgh (Bellaire) sandstone. Lewis Wetzel Cave was formed by the faulting of this rock as a result of Wheeling Creek downcutting into its own valley. * Allman, C. B., The Life and Times of Lewis Wetzel. Nappanee, Indiana: E. V. Publishing House, 1939. * "Lewis Wetzel," The West Virginia Encyclopedia. First edition, 1929, p. 998. * Meyers, R. C. V. Esq. Life and Adventures of Lewis Wetzel. Philadelphia: Keystone Publishing Co., 1890.